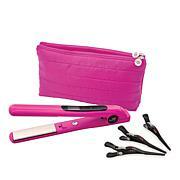 A styling iron that offers patented plate technology combining zirconium and titanium for unsurpassed styling results. - Section your hair into 1" sections. 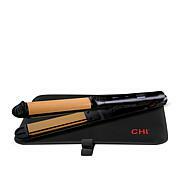 Place your CHI Smart GEMZ hairstyling iron at the root of your hair, closing it lightly. Glide iron slowly from roots to ends. Grab the next section and repeat. - Place the iron at mid-shaft and slowly rotate iron away from your body. Repeat for remaining sections. Comb or brush gently to blend sections together. 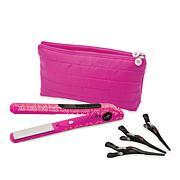 - For loose curls, use larger sections and, for tighter curls, use smaller sections. 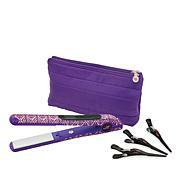 Place the iron at the root of your hair, lightly close, and pull iron 2" from scalp. Take end of hair strand and wrap it under and around the iron. Continue to gently pull and rotate the iron until you've reached the end of your sectioned hair to create a ribboning effect. The slower you pull, the better the result. Repeat. I love this iron! So much body to my thin hair. Heats up super fast. I ordered this on April 1st. It was expected to arrive today, April 9th. Now it is scheduled for April 11th. I am leaving tomorrow, April 10th on a 7 day trip and wanted to take this with me. I am extremely disappointed! Returning! Takes double time to use this than my 30$ conair from Walmart. The pressure that you have to apply actually hurts my thumb. Pulls hair strands. Need to use two hands. I could go on and on how awful this is compared to the cheap one I have.